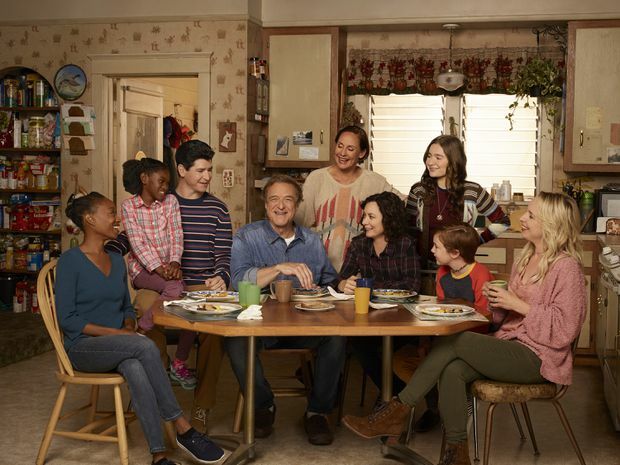 ABC's The Conners debuts on Tuesday at 8 p.m.
It’s just a TV sitcom continuing without the lead actor. The show must go on. That’s showbiz. But this one is different. It’s always different with Roseanne Barr, even when she’s not there, on the show. The politics of it become toxic. Trump-level toxic. The Conners (starts Tuesday, ABC, CTV, 8 p.m.) is the after-Roseanne Barr continuation of the reboot of Roseanne, which was cancelled in May after Barr went on a racist Twitter rant. It’s a major TV event. In the past week, leading up to the unveiling of The Conners, there has been a surge of online disdain for ABC, with rumours – from reports quoting only unidentified ABC sources – that the network now regrets cancelling the show and it feared that, without her, it had a flop on its hands. Barr was and remains a Trump supporter. The pro-Trump forces have been unleashing their vitriol. A lot of what’s been written in the past week reeks of a manufactured narrative with political intent. The show opens three weeks after the funeral for mom Roseanne Conner. How she died and the circumstances around her death cannot be disclosed in advance. Let’s just say there is a lot of mourning going on and there’s a stench of anger, too. There are some attempts at humour. “Laughing inappropriately is what Mom taught us to do,” says one of the kids. But in truth it would be hard to squeeze genuine laughter into what is more a tortured requiem for a character than a laugh-riot. “I don’t know where I belong,” wails Jackie (Laurie Metcalf), and neither does the audience, frankly. John Goodman is good as the grief-stricken Dan Conner. So good that you think he belongs on some other show, not this peculiar and sometimes tense concoction that is spooked, literally and figuratively, by the absence of a central figure. ABC’s own summary of the show overstates what’s happening. “This iconic family – Dan, Jackie, Darlene, Becky and D.J. – grapple with parenthood, dating, an unexpected pregnancy, financial pressures, aging and in-laws in working-class America. Through all the fights, the coupon cutting, the hand-me-downs and the breakdowns, the family prevails with love, humour and perseverance.” Actually, based on the two episodes screened, some of those twists do unfold, but without drama or genuine humour. There is sourness to it all, even as guest-stars are brought in to enliven the family dynamic and stretch beyond the grieving family in the Conner household. (Mary Steenburgen is in the opener and Juliette Lewis is in the later one.) Yes, issues of sexuality, race, religion and birth control are woven into the storylines but not in any searingly funny manner. There is more hand-wringing about social issues than humour. What’s illuminated really is that TV has come a long way from the original iteration of Roseanne and, lacking the dangerous fire of Roseanne Barr herself, The Conners looks dated. All of this matters for network TV and ABC in particular. The reboot of Roseanne was a stunning ratings success and there is tension, business and political, about this continuation. The preview screening of the opening episode and one later episode, for selected journalists, was done simultaneously on Friday in Los Angeles, New York and Toronto, with an ABC staff member flying to Toronto with the screener on her person. This type of top-secret activity isn’t about avoiding piracy, it’s about controlling the narrative surrounding a Roseanne-free series that will generate more news coverage and punditry than any new series this fall. What ABC can’t control, clearly, is the creative engine of the show. A continuation of the rebooted Roseanne was a good business bet and a nervy artistic bet. The upshot is a show that is wan, weird and, it seems, weirdly unfunny.